South Koreans were hoisted into the air and hailed as heroes by Mexican soccer fans across the world Wednesday after what seemed like a World Cup miracle — Mexico stayed alive in the tournament thanks to South Korea's unlikely victory in a totally different game. The second half of the Mexico-Sweden match was nerve-wracking for fans of El Tri, as the team is known, a reference to the three colors of the Mexican flag. As Sweden poured on three unanswered goals, all seemed lost for Mexico, even though the team was undefeated in the group going into the game. Beacuse of other results, losing to Sweden would mean they were no longer in control of their own destiny — Sweden would go through to the next round of the tournament in Russia while the reigning world champion, Germany, could secure the other spot in the knockout round by beating winless South Korea. Mexican fans in Ekaterinburg Arena were despondent in the final minutes of the game, until they received word from a thousand miles away in Kazan that brought surprised cheers. A late South Korean goal, then another, made the impossible possible. They beat Germany, sending the European giant tumbling out of the World Cup and keeping Mexico alive. 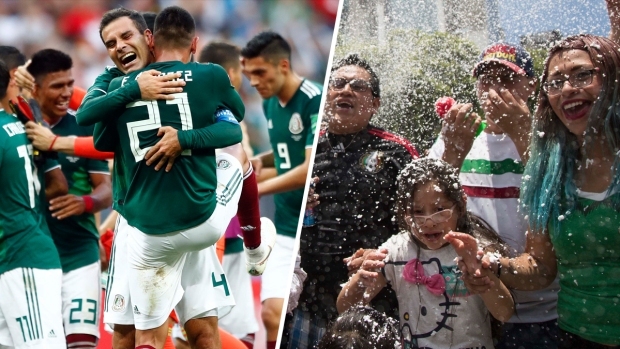 It is no secret that Mexicans are passionate about soccer and soon images on social media showed they were sharing it with any South Korean within sight. 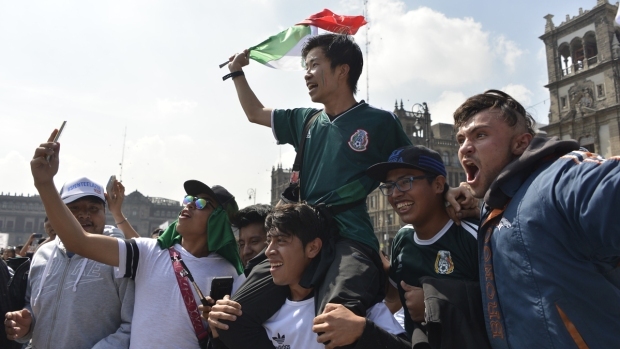 Fans of El Tri approached the South Korean embassy in Mexico carrying flags from both countries and yelling, "Coreano, hermano, ya eres mexicano," (Korean brother, now you are Mexican!) Consul General Han Bjoung-yin was reportedly carried on people’s shoulders and offered tequila as a sign of gratitude. South Korea’s ambassador to Mexico, Kim Sang-il, was also hoisted into the air. At the giant watch party in Mexico City's center square, the Zocalo, tension broke out into relieved cheers. Video posted to Twitter showed a massive crowdparading behind a man, said to be Korean, waving a Mexican flag from atop another man's shoulders. Outside the stadium in Russia, Mexican fans tossed a South Korean man in the air. Mexico fans at an event in the Zocalo Square in Mexico City celebrate at the end of the World Cup group F match between Germany and South Korea on Wednesday, June 27, 2018. Mexicans across the globe have shown their gratitude to South Korea other ways, including in memes, radio stations playing K-Pop hits and offers of free drinks. Thanks to South Korea, Mexico will play a knockout game against tournament favorite Brazil on Monday at 10 a.m. ET. South Korea's victory over Germany gave kept the door to the knockout round open, but the team was eliminated because Mexico was unable to return the favor and beat Sweden.